All I can say is WOW! MathLands is a completely FREE educational math app that makes kids THINK! Kids have to use logic, problem solving skills, and critical thinking to solve multiple levels of 6 different puzzles. Each puzzle is timed, has hints available, and has a section that tells the history of the puzzle. Kids can choose to start over. They can try again to get a better score or they can try again to get the BEST score. The app reveals the best possible score for each puzzle and challenges kids to achieve at that level. 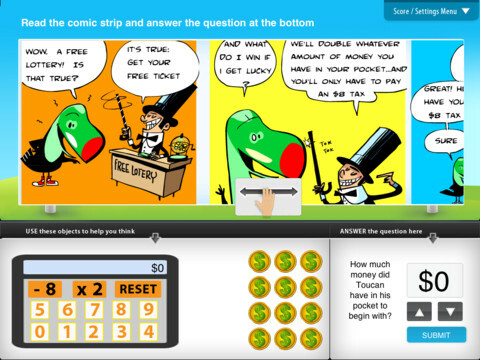 There is also a Math Comics section – problems are written in comic strip form. Kids solve the word problems by using the interactive manipulatives on the page. In a word full of math apps that stress practice and drill, this app is like a breath of fresh air. LOVE it!!! !